What Do Horses Cost? Everything. Somewhere on my roaming of the Internet I stumbled across a blog post in which someone commented on the meme saying, "What do horses cost? Everything." At the moment I thought it was cute and funny, and I moved on, which I why I can't cite my source right now... Hopefully I'll either remember or a very helpful person might leave a comment as to where I might have seen it. Even though at the moment I just glanced it over and moved on, it must have lingered in the back of my mind, because as I went through photos of Casey and I together today, that's the one thought that kept popping up in my mind. That Casey really has cost me everything, but that she has also given me everything in return. 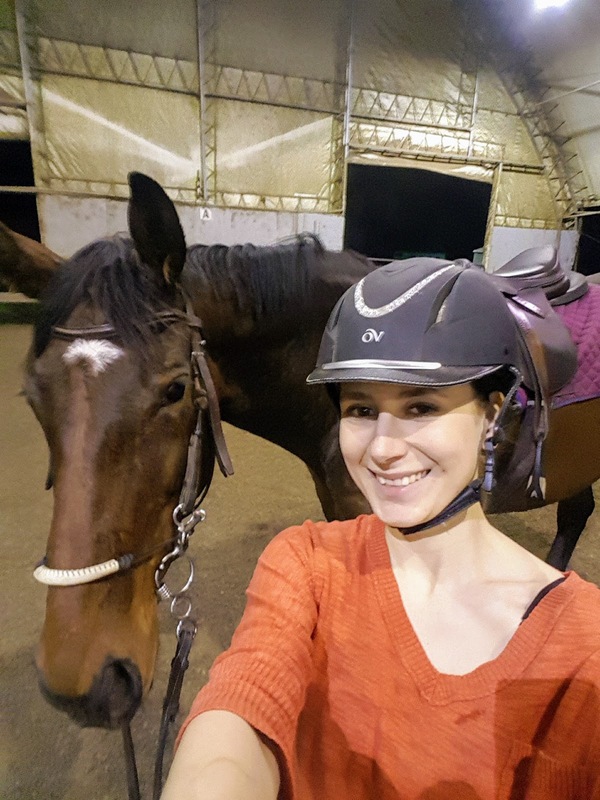 So I thought I'd write about it, just an "I really appreciate my horse" post to go along with the amazing photos that my fabulous sister took for me today. What does my horse cost me? What has Casey cost me? All the money. So much money. It makes me want to cry when I think about the amount of money that I spent on vet bills for her suspensory injury. My method of coping is to just not calculate how much money that really is. Just live in denial, charge it to the credit card, and make monthly payments. Thank goodness I almost am done paying it all off. So much time. This is another area where calculating this might make me burst into tears. I am at the barn six days a week. Some days I am relatively quick and can get in and out in under two hours, but the average is probably closer to three and on the long days it can be up to eight. I work at my barn part time to support my horse habit by lowering the cost of board and so that is why time is a killer for me as well. Blood, sweat, and tears? Yep, she'll take that too. Thankfully Casey hasn't made me bleed a ton, just minor scrapes and the occasionally gnarly bruise. She also hasn't made me cry too much, just keep avoiding calculating things and I can mostly keep tears in check. She has taken all of the sweat though. The amount of work I've put into her training is crazy to think about. I've done all of her re-training entirely on my own, using the advice of others, but doing all of the physical work myself. What has Casey given me? Confidence in myself. Working with Casey, a horse who is difficult most of the time, has shown me that I really do have a good skill set. I'm by no means a pro, but I am a decent rider and horse person. I know how to handle myself around horses, even when they are having bad days. The confidence that she's given me not only applies to life at the barn, but it definitely applies to my work life. I don't talk about it much here, but I teach 7th graders as my real life job. After dealing with a crazed, angry, thousand-pound animal, 7th graders don't scare me. And let me tell you, having confidence when dealing with a room of students is key. A sense of calm. Again, not something that I mention here all the time, but I am a super anxious person. Like anxious to the point that I could probably get diagnosed with something, but doctors and the medical field also make me stressed, so instead I just cope with it on my own. When I'm with Casey, all of the anxiety melts away. Even when she is being a turd, I am never stressed around her. I'll be a ball of buzzing anxiety after a long day, but when I'm at the barn it all vanishes. Casey gets me to live in the moment and appreciate what I have. Knowledge and skills. Because Casey is not an easy horse, she constantly keeps me on my toes. She's a great teacher and from working with her I have learned so much about horses, horsemanship, and riding. This is where her opinionated nature is really a blessing in disguise. She always lets me know if I'm doing something "wrong" and so I am able to correct myself. I've learned more from riding Casey in a year than I've learned in all of my other years of riding combined. All of the love. Casey is not the most affectionate horse in the universe. She likes most people, but for the most part she just keeps to herself. That being said, she shows me daily that she does love me. Some people might think that horses don't love their owners, but I solidly disagree. Casey shows me love by letting me give her long hugs (sometimes even "hugging" me back by wrapping her neck around me). By giving me nickers sometimes when she sees me walk out. By coming when I call and following me around like a puppy dog. By the look in her eye when she watches me. I have no doubt that my horse loves me as much as I love her. So yeah, my horse does cost everything. But it's so worth it. Miss Casey and I are about now halfway through our month of intense strengthening workouts. 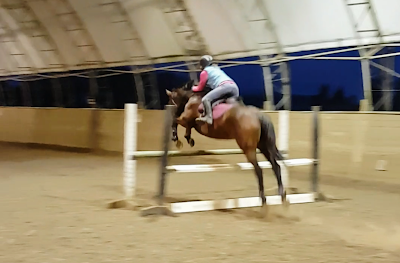 As a brief reminder, she had a clean ultrasound on her suspensory injury (meaning it is healed), and so we ramped up the workouts to build strength and fitness back. We are on the last month of that and are currently doing twenty minutes of trot and ten minutes of canter in each ride. When all of the walk breaks are factored in, that means we are doing hour-long extremely demanding workouts five days a week. To say it's intense is an understatement. The first week of extreme workout mode was brutal, Casey and I were dying by the end of each ride. The canter is what was really killing us, we couldn't sustain it for more than a minute at a time in that first week. We just finished week two and I think we've hit that sweet spot where it is a feasible workout, but it still is challenging. I'm struggling just as much as Casey is to keep going by the end of each ride, but we are able to do the entire workout without totally killing ourselves. It's really exciting to see Casey improve because her improvement is exponentially growing at this point. At the beginning of this month she was still taking lame steps, now she might take one or two in the entire hour long ride. At the beginning of the month she was only about to canter for a minute at a time, now we are up to a little over two minutes and a half on a good day, and our average is two minutes at a time. She could probably go for longer than that, but as soon she starts to seem tired I ask her to take a walk break. Trying not to break my horse here... At the beginning of the month she was still hesitant to relax her back and open her stride, now it's her go-to mode. She LOVES her stretchy trot. 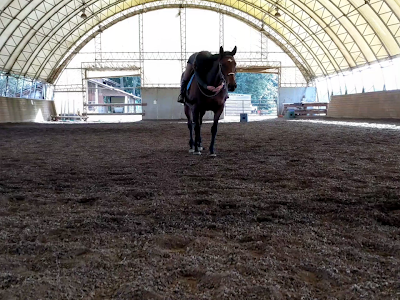 The other day I was able to trot her around without any reins and she was just plodding along with her nose almost to the ground. The most noticeable change when I ride her is that her canter is coming back. 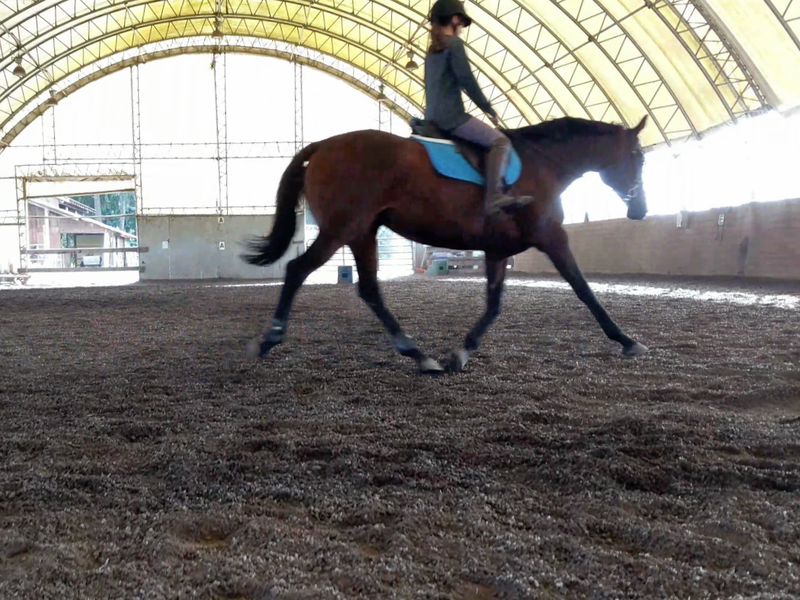 When we first started cantering again, it was awful. She was downhill, rushy, and trying to get me to carry her head for her. Now she's feeling really uphill, she starting to relax her speed (most of the time), and she's carrying her own head. The canter is still not as good as it was pre-injury, but considering that she had a tear in a major hind leg ligament, her canter is super impressive. She's definitely worse to the left, when her previously injured back leg is taking more of the impact, but even that is improving daily. The thing that I am most proud of Casey for is her attitude. She's like a different horse from the beginning of summer. She is being so sweet and kind, even to the ponies who she despises. She did try to kick Calvin, the border collie, today, but it was because he was right behind her and she doesn't trust him. Plus it was a lame attempt at a kick, so I don't think she was really trying to hurt him... She is being perfectly willing to do anything I ask both under saddle and on the ground. She hasn't thrown any fits about anything (besides that one minor meltdown last week). Another boarder at my barn even commented on how happy Casey seems. She really is a horse that needs to be in work; she's so much happier with it. At this rate, I'm super hopeful that the end is near and that we'll be back to jumping on schedule. November 8th is the last vet "check" for the whole rehab process. Vet really just wants to take a quick look at Casey's movement and if all is good he'll give the green light for jumping. We have to get through just a few more weeks without any missteps. I think the odds of Casey relapsing get smaller and smaller each day that passes and am super hopeful. Maybe not so refined, but at least we have enthusiasm! If you've been following my blog for a while, then you know that Casey has been barefoot since January. Basically, she mauled herself in December and had to have some time off, so I took the opportunity to pull her front shoes and see if she could handle going without them. Our adventures in barefoot land were pretty great. For a Thoroughbred with pretty flat feet that were prone to flaring, Casey was surprisingly sound without the support of shoes. I loved it because it cost so much less. Casey's winter coat is coming in and I literally cannot stop hugging her. She feels like a teddy bear! And then we had the suspensory injury... and while Casey was still doing just fine barefoot, after talking with Trainer, Vet, and Farrier, we all agreed that having the support of shoes would be good preventative care to take care of her leg in the future. I'm all about preventative care now, because I learned just how terrible rehab is with an OTTB. Girlie has now had shoes on for over a week and so I've come to some conclusions. The first few days, she was really just getting used to having shoes on. Farrier recommended riding with bell boots on for a while to prevent her pulling the shoes, but that just pissed Casey off (because of course it did). Now she's gotten used to the extra weight and the feel of the shoes, and I've gotta say, I'm so impressed! Just look at that trot! With shoes on, Casey is much more willing to step under herself, resulting in some really fabulous movement. 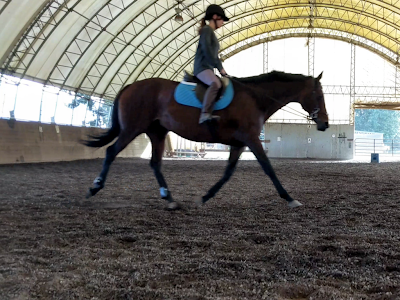 Her trot feels much more expressive and free-flowing. In the canter, she seems much more uphill. Oddly enough, her walk seems worse with shoes, because she is stepping so far underneath herself that she keeps "flat-tire-ing" her own self (when you step on the back of someone's heel). I think she annoyed herself by doing this and now she's being too pokey at the walk. I think I've been converted and Casey and I are now shoeaholics. If her movement feels this great and we are still building strength in her back end after the rehab, I can only imagine what it will feel like a few months from now. Question for you: Are your horses shoed or barefoot? Why did you make the choice that you did? There are two types of people in the equestrian world. Those who don't care about the appearance of things, they just care about the horses, and those who care both about appearance and horses. Some might break this rule, but in general it is a common observation. The people who don't really care about appearance are the ones who show up to ride in any old clothes. The mindset is that it is the act of being at the barn that counts and the clothes shouldn't matter. The people who do care about appearance tend to hold the philosophy that professional dress is appropriate in riding, because it shows that they are serious about their sport. Guess which type of person I am? True confession time. Internally, I am 100% a person who thinks that barn appearance should not matter. The time spent with horses is the priority to me and if that means showing up in any old clothes, who cares! You're making the time with your horse and that is what truly counts. I have ridden in jeans, leggings, sweatpants, raggedy T-shirts, and even my professional work shirts on the occasions that I was too lazy to change. Last year I totally just tried to get away with wearing whatever I wanted at the barn. This picture makes me cringe at everything, so enjoy! That being said, the past year I've been trying really hard to change this about myself. 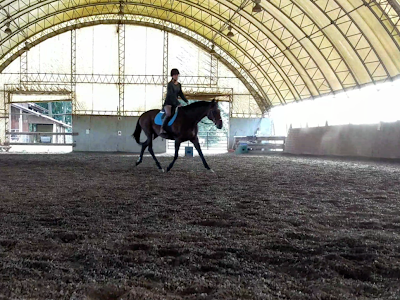 I wear breeches or riding tights every time I'm at the barn (no more riding in jeans for me). For tops, I wear either a plain t-shirt or a sunshirt, almost always tucked in. I wear belts even though I actually kind of hate them. I wear tall boots for riding and tall rain boots when I'm not (Oregon life means rainboots all the time). I'm trying to follow the mantra "dress for the job you want," as it applies to barn life. My dream is to eventually be fully employed in the equestrian world, as a barn manager, barn owner, and/or trainer. Although dressing up won't necessarily get me one of those jobs, it does impact how other perceive me. I want others to see me as professional, organized, and a good rider. My clothes don't change my riding and training abilities, but they do influence the snap judgements that people might make of me. Another factor that inspired me to dress more professionally at the barn, is that I am an employee at my barn. I am the assistant trainer and so my appearance is a direct reflection on my barn and my trainer. I feel that I should dress in a way that reflects well on my barn. If I weren't an employee at my barn, I might feel differently about this, but that's the reality of my life right now. For the most part I don't mind dressing more professionally at the barn. I love clothes and so it's fun to me to dress up. BUT, and it's a big but, it frustrates me endlessly that this is yet another aspect of our sport that makes it out of reach for many people. 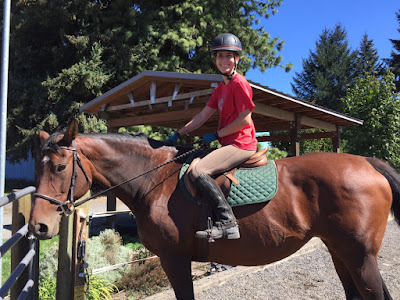 Being around horses is expensive already, so when breeches cost around $100 on average (it's hard to find any under $50) and equestrian-designed shirts cost about the same, it makes it so that a lot of people can't even afford a basic riding outfit, yet alone multiple outfits or a spendy showing outfit. It probably seems ironic to be complaining about financial equity issues in a sport so obviously geared towards society's upper elite, but it is frustrating and sad in my opinion that the cost of our sport shuts so many people out of it. I have am highly educated and have a stable career job, but can barely afford my sport and know many others in the same position as me. Thankfully, many companies seem to realize that there is a market for lower-priced equestrian clothing and attempt to fill that gap. Tuffrider, Ovation, and Horze are just a few brands who try to appeal for people like me. People who want to look the part, but can't afford to blow hundreds of dollars on clothing. It is possible to dress the part if you are on a budget, I know because that's my life. Last year this was my formal riding outfit. It's not terrible, but now I'd tuck in the shirt. Also I hate half chaps with a burning passion now. Question for you: How do you dress when you go to the barn? What determines what you decide to wear? So I am absolutely in love with Olivia and her horse Frankie at Hellomylivia and have been for quite some time. She is wonderful with words, is about my age and so we have similar hopes/dreams and challenges, and her horse is to die for. Seriously, how can he be so perfect? Anyways, I hopped on her blog and saw that she wrote a post about her perfect horse and was inspired to do the same. Now, I sincerely hope that Casey is still going strong ten years from now and that I won't have to worry about buying another horse for quite some time, BUT I think about my future horse (or horses... all the horses...) a lot. The problem with a post about a perfect horse is that I don't really know what I want in a perfect horse. Or rather, I do know what I want, but I want two perfect horses. Is that selfish? Hear me out. I really, really, really want to get a baby. Not a baby-baby when they are oh-so-cute and little, but also self-destructive and insane. Also not a yearling, because they are awkward as all get-out. I want a 2-3 year old who has been taught some of the ground basics, but mostly has been left alone. I want this baby to have been bred by reputable breeders. I want this baby to have super-star parents who are successful in the hunter/jumper world. No backyard breeders for me, please. I would be able to train baby horse myself (with the help of Trainer) so that I've installed all of the buttons and know the background of the horse. I don't want a baby horse that has already been started under saddle, because so many people don't know what they are doing and mess up the horse by either working it too hard, too young, or by not training it properly. Ideally baby horse and I will have a couple of years to build a relationship and work on the basics and I would plan to start working on real stuff (jumping, dressage basics, etc) when they were about 5-6. In a perfect world, I'd buy baby horse when Casey is starting to slow down, but before she completely retires, that way I'll always have a horse to be riding. The other part of me thinks that baby horse is going to be a lot of work, time, and energy. Plus baby horse might be kind of spendy if I get what I want (a well-bred baby). So I also want a 6-7 year old show horse, who has already been trained in the basics and now is starting their jumping career. If I bought this horse, let's call it show horse, I'd want something that I know is talented. The meters should be easy-peasy for show horse, and it should have the scope for even higher. 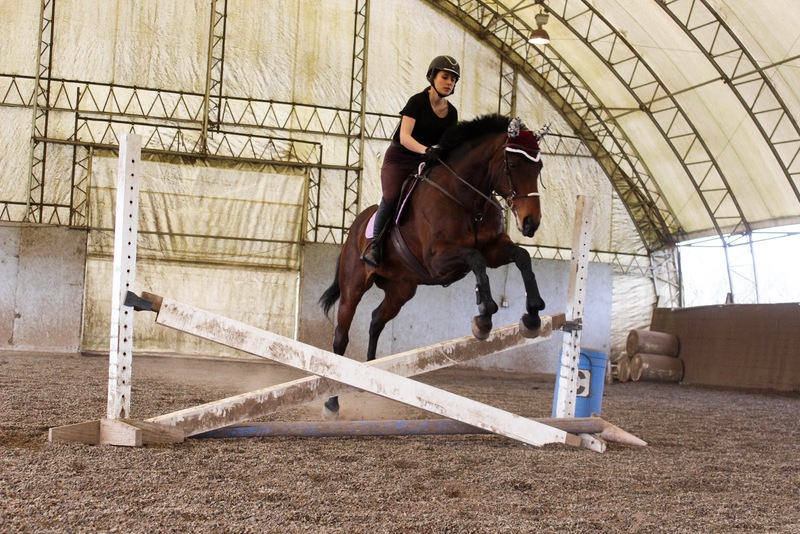 I'm ok with show horse being green over jumps, but the talent and brain need to be spot-on. 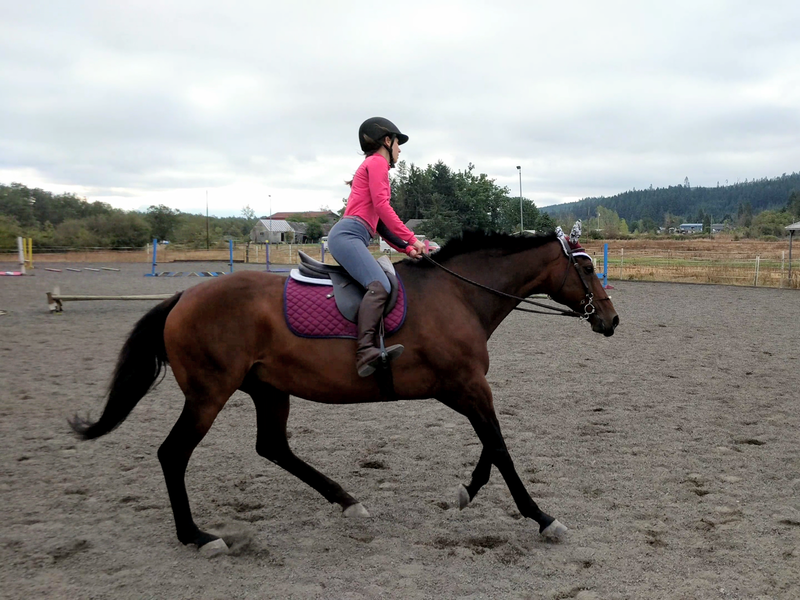 Show horse would have impeccable ground manners and would be a fluid, beautiful mover. Show horse never takes a wrong step and oozes gracefulness. 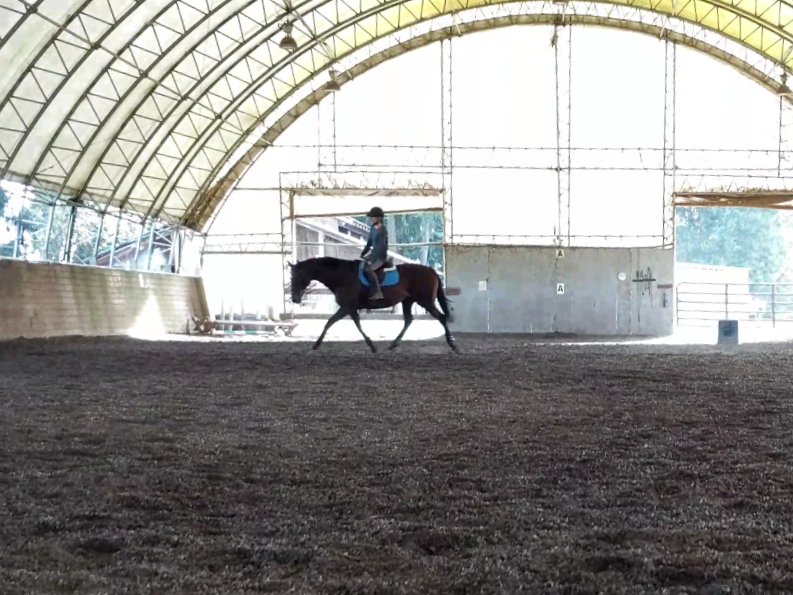 I would be able to take show horse into a dressage arena with no questions asked. Show horse should be super responsive and soft, but have a bit of fire. Go should always be the right answer. As far as details of the horse, they are pretty similar for both baby horse and show horse. I want it to be some type of warmblood or Thoroughbred, or some cross between those. It doesn't have to be a purebred horse, it just has to have nice conformation. I love mares, so would prefer a mare, however I could be swayed by the right gelding. I know that they aren't the most popular, but I love chestnuts. I also do love dappled bays. Either way I want the horse to have a bunch of chrome. In a perfect horse I want a blaze and four socks. A long, flowing mane and tail is a must. Bay with a tiny amount of chrome. I want a bit more chome than this, but I do love Casey's coat. Between baby horse and show horse, I'm not sure which one I want. A lot depends on Casey's career and life span, because I really do always want to have a rideable horse. Also, this is very dependent on my future economic status. Right now I can barely afford one horse. And I got her for free... So I'm going to need to be in a lot better financial shape to fulfill any of these dreams. My dreams of a perfect horse also are constantly evolving. Since I'm not a person who shows (hopefully someday I'll get to show a bit), I don't NEED my horse to be the most talented, amazing horse. 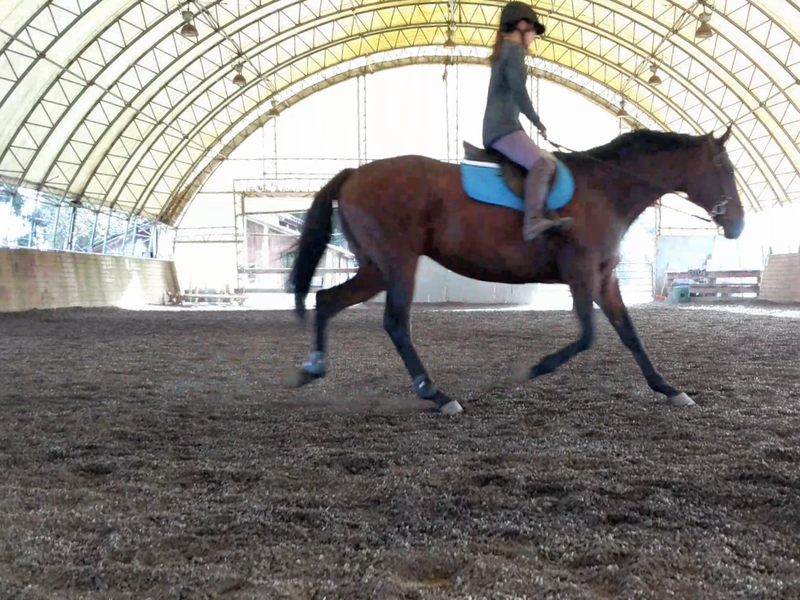 It'd be nice and fun, but I just want a horse who is fun to ride and be around. Another point I'd like to make is that I really do think that Casey could turn out to be my perfect horse. She's changing so much week-by-week and is so much fun to work with. I've only owned her for a year, six months of which she was in rehab, and already we've done things that I never thought would be possible. The biggest factor in determining which horse is perfect for me is honestly my connection with that horse. Casey and I definitely have that. She might not tick all of the boxes, but she is my heart horse which makes all the difference.